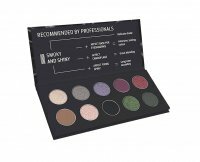 PRESSED EYESHADOWS PALETTE - SMOKEY & SHINE by AFFECT. 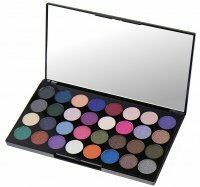 Set of 10 eye shadows. 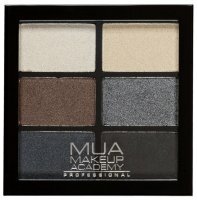 It consists of perfectly matched shades of matte, satin and foil finish, which will allow you to create makeup for every occasion. The color palette of SMOKEY & SHINE allows you to make especially effective, evening stylizations. The product is intensively pigmented, at the same time blends well, and keeps on the skin for many hours, without splashing or rolling in eyelid bends. The mother of pearl contained in the formula will prevent premature aging. It has a subtle scent that will put in a good mood. The product is available in an elegant and durable packaging made of thick cardboard. It will enable the creation of both daytime and evening make-up. It guarantees a precise and pleasant application without sprinkling. The product has been enriched with a pearl mass and a subtle scent note. - SS-10 - dark gray. Shipment of this product to Romania, Kuwait, United Arab Emirates, Lebanon, Qatar, Egypt, Saudi Arabia, Greece, Cyprus, Bulgaria, Russia, Kazakhstan, Armenia, Belarus, Kyrgyzstan, is not possible!